Shin splints (also known as medial tibial stress syndrome or tibial periostitis) is the term used to describe pain and inflammation along the tibia in the lower leg. Shin splints are a common complaint among all rebound athletes (runners, gymnasts, dancers, etc). Although there are a variety of different causes, shin splints are generally accepted to be a cumulative stress disorder rather than an acute injury. This means that they are not sudden in onset (though the pain may occur suddenly). Rather, they consist of many overlapping factors that eventually overwhelm the leg and lead to pain. 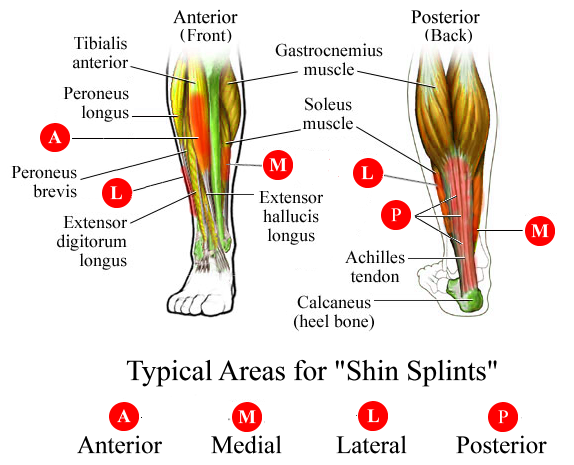 Traditionally, shin splints occur with unusual loading on the lower leg during activity. In this case “unusual loading” could be due to an increase in force (weight gain, higher forces with new landings), a sudden increase in activity (too many rebound skills at the beginning of the season or more walking/running than usual), or poor anatomical loading (flat feet, bad footwear, weak & de-conditioned muscles). The body is designed to “repair” itself by adapting to new forces. In the case of shin splints, the body is overwhelmed and the bones/muscles can’t keep up. The end result: lower leg pain with walking, running, jumping, and sometimes just pressure over the area. The “shin” or lower leg is composed of two bones. The tibia and the fibula. The tibia is the weight-bearing bone while the fibula acts as a stabilizer and an attachment point for muscles. The bone are connected by a thick, fibrous membrane known as the interosseus membrane. This is what gives the lower leg stability, provides attachments for deep blood vessels/nerves, and anchors many of the lower leg muscles. The tibia and fibula, like all bones, are covered by a saran-wrap-like cover known as periosteum. This tissue protects the bone and allows for its nutritional support. It is very tough and inelastic which prevents it from stretching and gives it its strength. Small fibers known as Sharpey’s fibers connect the periosteum to the muscles and fascia (connective tissue) of the lower leg. With normal running/walking, the anterior tibial muscles contract to slow the foot down on heel strike (prevents your foot from “slapping” the ground). This contraction pulls on the tibia (periosteum) and stresses the surrounding fascia. When an activity changes and the muscles pull on the Sharpey’s fibers (attached to the periosteum) more than usual, the periosteum (and the underlying bone) have to adapt by becoming more thick and dense. In the case of shin splints, the forces are too great and too frequent, and the periosteum cannot adapt fast enough. It becomes inflamed (swollen) and causes irritation/pain along the length of the bone. In many cases, the swelling can be palpable (small squishy bumps along the length of the tibia) and even a gentle touch can be very painful. In severe cases, when pain is ignored and the activity is continued, the tibia itself begins to break down. Small stress fractures (hairline cracks) develop as the bone cannot build its density up fast enough to deal with the forces placed along it. If left untreated, the tibia itself becomes more prone to pathologic fracture (meaning fracture with a lower stress than expected). Gymnasts are more prone to shin splints for several reasons. First, they train barefoot. The muscles of the foot and lower leg have to work harder to maintain the shape of the foot and stabilize the ankle without a shoe, thus increasing the pull on the periosteum. Second, the surfaces are more firm and the impact is transferred up into the tibia. Third, the landings are heavier and more frequent than most other sports. While a runner’s foot strikes the ground 760 times per mile, it is from a height of 2-4 inches. A gymnast’s foot strikes the ground less frequently (not including the run in a vaulting/tumbling pass), but from up to 8 or 10 feet off the ground. I’m not a physicist, but if F = ma then it’s a wonder every gymnast isn’t walking around with this injury. What you’ve all been waiting for I’m sure…The most commonly accepted treatment for shin splints is rest. However, while effective, this is useless for the gymnast in training or in the middle of competitive season. Plus, once you’ve rested, you still have to strengthen to prevent them from a speedy return! Ice: In the early, middle, and late stages ice is a key factor in dealing with the pain. Ice over the shin for 15 min after ANY ACTIVITY (this includes walking to and from class) to decrease pain (ice slows the transmission of the pain signal along the nerve) and to decrease swelling (along the periosteum/interroseus membrane). Be sure to keep a layer between the skin and the ice to prevent ice burn. Strengthening: using ankle and foot exercises to strengthen the muscles of the lower leg and foot is key. There are several methods to use (photos to follow soon). Footwear: While a change of footwear in the gym isn’t practical, a change for every other activity of your life is. Toss the flats, the heels, the flip-flops, and the Crocs. Put on a pair of sneakers with a good sole and cushion. It doesn’t matter much the type (barefoot, neutral, motion-control, or stability) – rather it’s the support and the shock-absorption that are key. If you have a very flat foot, try a more supportive shoe (motion-control or stability) whereas if you’ve got a good arch, a barefoot or neutral shoe might work for you. The reason this matters is that the lower leg muscles support the arch of the foot – so if you add external support for that arch, you give them a rest. You could even try buying an arch-support insert and putting it in your current shoe (I know money can be tight). Skill progression: If you’re working new skills, build up your tolerance on that piece of equipment. Start with 10-15 minutes of DMT/tumbling one day and add up to 5 min to that number per week. (And here’s where I know I’m going to lose some of you). It takes your body time to adapt, and if you’re pushing through the pain, odds are you are making the problem worse and prolonging your recovery. Also – try running more on the balls of your feet. (This means avoid heel striking by taking shorter steps). This will give those muscles a break and allow you to keep training. Taping/external bracing: Using an ace wrap around the shin or having a coach do a compression tape can help support the periosteum/muscles in the short-term. Just know that this is a temporary fix and ultimately strengthening and activity progression are the only true cures! NSAIDs: Non-steriodal anti-inflammatories. These common over the counter pain medications can help take the edge of the pain and decrease the inflammation. Good right? Well – mostly. Be sure to stay within the recommended doses, take with food, and only take for a few days time. They are tough on the digestive system and can slow the rate of healing when used in excess. As a general rule, check with your doctor if you’re unsure of how these can affect you and/or if you’re on other medication to prevent interactions. Nutrition: As a general rule, getting the right amount of calcium and protein are essential in preventing and treating shin splints. If possible, it’s worth avoiding foods that can increase inflammation in the body, such as: fatty meats, fried foods, whole milk, sugary foods, processed grains (white bread, etc), foods with excess salt, and butters/oils. Be sure to stay hydrated and if you’re really working out hard, add a low-sugar sports drink to replenish minerals and prevent muscle cramping (could make the shin splint pain worse). This entry was posted in Ankle/Foot, Shin Splints on September 24, 2012 by Angie. hi, im a gymnast in level 6, I have strong pain in the back of my heel, is that a leading cause to shin splints?? Hi! I don’t want to diagnose your injury, but heel pain is not often a likely cause of shin splints. Traditionally heel pain is more related to achilles tendonitis, Sever’s disease (in children and adolescents), and plantar fasciitis. As always, if the pain is greater than a 4/10 and is limiting your progress, talking to a doctor or physical therapist is always recommended! Most people feel pain on the lateral aspect of the shins (toward the outside and front). There are other areas that can be affected, but in those cases, it’s best to seek in-person medical advice.